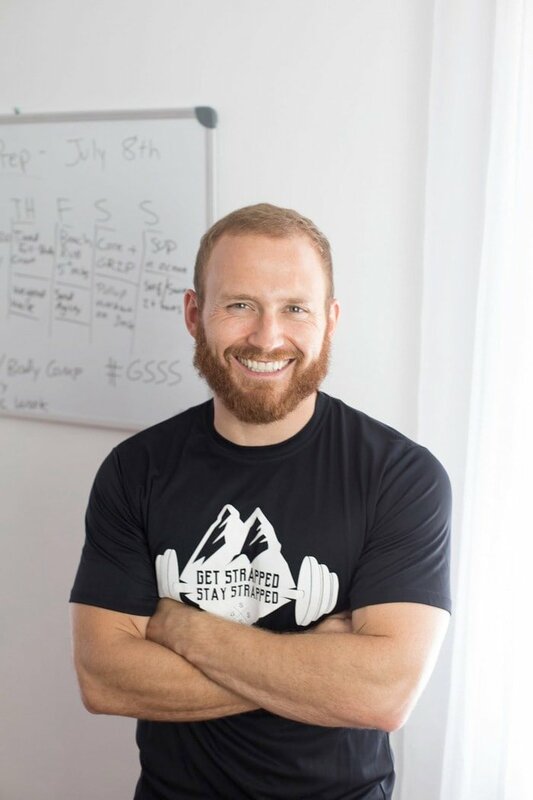 This post has been a LONG time coming, and I’m super excited about it because I’m not only sharing a little insight into how I got started with a consistent strength training routine, but I also have my good friend and trainer, Dave Robinson from Get Strapped Stay Strapped, here to share his take on strength training for women. He has a ton of valuable tips that I think you’ll really benefit from. Let’s start with my current workout routine, because although I share strength training videos on my Instagram story occasionally, I haven’t shared what’s happening on the fitness front for me personally in a minute. A little over a year ago (October 2016) I joined a group personal training gym called Rio Fitness here in Richmond that focuses on strength training. Prior to starting with this gym I’d done some strength stuff on my own, but most of my workouts were either more cardio focused or endurance based. Way back in the day I experimented with Body for Life and Jamie Eason’s LiveFit training program, and more recently I was hooked on Pure Barre and Orange Theory. So while I had done some strength training, it was never super consistent and I kept the weight relatively light. After dealing with hypothalamic amenorrhea for two years, I could tell my body needed something different and decided it was time for me to give strength training a try. It took some convincing, but the owner and head trainer at Rio Fitness, Ana, kept mentioning that she thought it would be good for me until I finally said I’d give it a shot and joined her gym! Over the years I’d heard and read so many times that strength training, especially heavy lifting, is the key to building lean muscle and actually changing your body, but gosh was I resistant to this fact for so long. It’s kind of like a couple years ago when the low-fat myth was getting busted… it took me (and others) quite a while to actually retrain our brains because we’d been taught that no-fat/low-fat was healthy for so long. The same thing happened to me with strength training. I thought cardio was the end-all, be-all for working out because it’s what gets you super sweaty and burns the most calories. It didn’t help that the weight section at my gym was always full of men and no women. As it turns out, strength training is AMAZING for women (read more about the benefits here), and since I’ve embraced that fact and started consistently working out at a gym that focuses on functional heavy lifting I’ve seen the benefits firsthand. I’ve gotten so much stronger (without getting bulky), my legs and arms look more toned, my core is stronger and my posture has improved — which is huge for someone with scoliosis. I’m still on a journey to building more muscle, especially in my back-body since one of my big goals for 2018 is to do a pull-up, and I’d love to see a little more definition in my arms and abs, but I’m so happy that I finally started strength training because it’s been a game-changer for me. So now that I shared my strength training story and the benefits I’ve seen, I want to introduce you to my friend Dave. As an elite athlete and fitness coach to both women and men he knows a thing or two about strength training, so I’m excited for him to share a little insight into why strength training is essential for women and how to get started with it, along with a few extra little nuggets of information that I know you’ll find helpful. Well, you can’t “tone” what’s not there! In fact, “toning” isn’t even really a thing; it’s simply reducing body fat to a certain level so that you can reveal muscle underneath. If there isn’t muscle underneath to show off once you drop the pounds, then you definitely can’t tone anything! Building muscle through proper strength training (aka lifting weights) is so important NOT ONLY for attaining that killer physique, but also for aiding in fat loss, optimizing hormones, and building and maintaining bone density and mobility as we age. Focus on functional fitness. No one wants to be all looks and no game. Focusing on the six basic foundational functional movement patterns will help you both look and perform your best. In addition to the more familiar moves like squatting, hip hinging (deadlifts), pushing (shoulder press) and pulling (pull-ups), emphasis should be placed on loaded carries and core rotation for the biggest bang for your buck. Loaded carries and weighted walks are especially crucial for long-term fat loss because A) they’re easy to recover from, B) they aren’t too strenuous since they don’t raise your heart rate too high, and C) they help build muscle in the core, legs, upper back and shoulders. The good news is that they’re super easy to do! Use more weight. If you typically pick up those 5s or 10s when you lift, try this: double it. Yeah, seriously! You’re WAY stronger than you think. You can carry your own suitcase and load it into the trunk of the car (25–50 lbs), you’ve carried in bags of groceries on one arm with a kid in the other — hello loaded carries/functional fitness 101! So don’t be afraid to pick up those 20s or 30s, especially for those major compound movements that utilize your big movers like squats, rows, lunges and weighted walks. Again, focus on proper form — lift from the legs, keep your core nice and tight, and squeeze the weight hard! Use the mirror, not the scale! I’m not a huge fan of using the scale as a frame of reference for how successful or not a program has been. Want to know why? Well, you can work your tail off for 12 weeks, lose 10 lbs of fat from all your “problem areas,” add 5 lbs of muscle to alllllll the right places and look like a COMPLETELY different person. I guarantee that your energy, confidence and vitality will be through the roof… yet the scale will only say you lost 5 lbs over three months! What the heck!? There are a myriad of factors that go into how much you weigh at any given time, including hydration, recent carbohydrate consumption and storage, and hormones and stress levels. If you’re looking for quantifiable benchmarks, pull out the tape measure once a month or so and take down some numbers. This will give you a good baseline to back up what you see in the mirror. So don’t pay too much attention (if any!) to the scale, and instead look to the mirror to show you how much your hard work is paying off! Focus on recovery. You can’t go all out all the time and expect to be able to sustain yourself, no matter HOW much of a badass boss babe you may be. Recovery is so key and such an overlooked area of fitness! Sleep, oh dear sleep (cue angelic music), is the key to unlocking your fitness goals. You don’t actually make gains (or losses if you’re talking lbs) while you are working out; your body adapts after it has a stimulus (workout) that stresses it so much that is has to allocate resources to repair itself and build back even stronger than before to better deal with that stimulus next time. You have to rest and repair in order to get those results, and that happens while you sleep! Assuming you’re giving your body the nutrients it needs to recover, you’ll show up to that next workout even stronger. Thank you again to Dave for taking the time to put these tips together! Now I’d like to hear from you. Have you incorporated strength training into your workout routine yet? Is this a topic you’d like to learn more about? 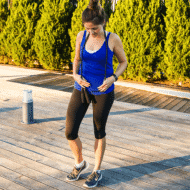 I just jumped* back into the gym after an unforgivable two-year hiatus from real exercise, so this post couldn’t have been more timely or helpful. Thanks for this real deal information. I am totally one of those people who cranks it out on the elliptical and never looked twice at the treadmill. * “jumped” might be hyperbolic. It was more like a slow promenade. Yay! So glad this post was helpful, Lindsay. I love Dave’s approach because he’s so focused on rest and recovery… something I’ve struggled with in the past. More isn’t always better, ya know? Brittany you are so stinkin cute!!! Love that spirit! I also appreciate all your endless desire to figure this stuff out and that I benefit. Thank you. What weight vest do you use? I have seen some more sleek ones but the weight is 8-12pds. Enough? I needed to grasp how weight training is vital to aging well, because it helps with hormones, balance and mobility. Bonus: you will look and feel your best!! Strength Training for the win all the time! Yes, it’s very important and recovery is key. I strangely started lifting heavy weights, functional training about the same time you did, October 2016 and one of my goals was to do a pull-up (never done one in my life). The day I did an un-assisted pull-up was the happiest and greatest I’ve ever felt. I’ve continued to lift, have changed my body perception, and learned to eat to properly fuel my workouts. I’m a huge advocate of strength training and glad to see you found it too. This post could not have been more timely for me! I know that strength training is so important and so good for our bodies, especially as women, and I’m dying to start a routine. I’m intimidated and a bit overwhelmed though- do you know of any beginner plans for strength training? I belong to a regular gym so am kind of going at this alone. I’m so excited to start! Hi Sarah! I’m so glad you enjoyed this post. There are a ton of beginner strength training plans out there. 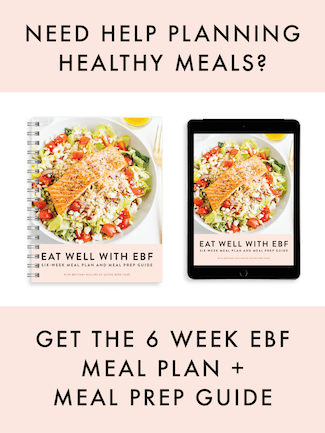 I personally have tried a few including Jamie Eason’s LiveFit program, which is totally free and a great place to start. I also highly recommend chatting with a trainer as you get started — even if you do just a few sessions with them. This will ensure you’ve got a good plan to reach your specific goals and you’ll know you’re doing all the moves with proper form. After a few sessions you’ll likely feel 100% confident to do the workouts on your own. I love this post! I just started incline walking at the gym I work at and love it! My knees decided that running is out- for now! I am going to bring my weighted vest and try it out! And strength training is my jam! I hate cardio, haha! Thank you, Brandy. I LOVE incline walking too! Let us know how wearing the weighted vest goes! What percentage of your body weight should the weight vest be to start using one? I loved this post! Now, I have recently had a baby and I have been really discouraged in working out after my c-section. 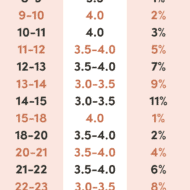 I am 6 months post-baby and was looking to start working out again, but sleep is definitely deprived probably for the rest of my child-rearing years. LOL How much does that impact results you typically see from working out?